Dangerous area of Face: It is the Area in the Face where infection in this region can lead to spread of infection to the Cavernous Sinus which leads to Cavernous Sinus thrombosis. Which directly spreads infection to the Brain, which can be fatal. Where is Dangerous Area of Face Located ? 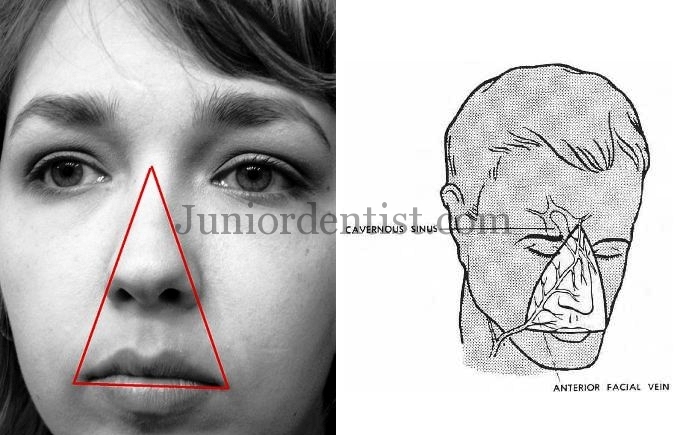 It is also called as the “Danger Triangle of Face” as the area is in the shape of a triangle, with the tip of the triangle in the medial angle of the eye and the base present covering the lower part of nose and the upper lip. Why is it called the Dangerous Area of Face ? The presence of loose areolar tissue containing the emissary veins allows the spread of infection through the emissary veins into the cavernous sinus which further leads to cavernous sinus thrombosis. How does the infection Spread from dangerous are of face? Near the medial angle of the eye the supra orbital vein, which is a tributary of the facial vein communicates with the superior ophthalmic vein present in the orbit. the superior ophthalmic vein drains into the cavernous sinus. The deep facial vein also communicates with the cavernous sinus through the deep facial vein and pterygoid plexus. By spread of infection through the dangerous area of face which enters the cavernous sinus the following nerves which are present in the Cavernous sinus will be affected leading to severe clinical symptoms due to loss of function of respective nerves present in the sinus. I like ur post. Its simplified and straight to d point. it’s good, easy and simple to know the course of infection.. I lyk ur post bcox is easy 2 understand. While all this is true, I find the most immediate distinction between here and any there on the face or body is this is the tuffest area (takes most effort) from which to staunch bleeding. Then yes, be wary of infection… This is known in Chinese martial arts, but I’ve experienced most directly from the odd nick there when shaving. What is the importance of that area?